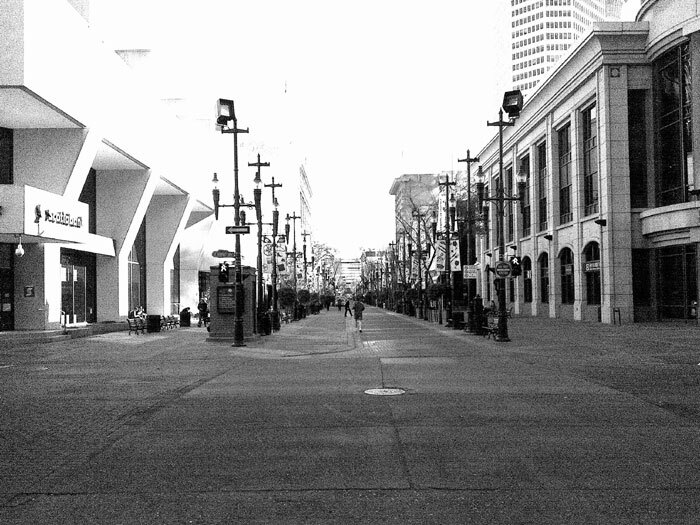 Now I’ve never really thought of myself as a misanthrope, but I love to see empty cities. Those cinematic shots of deserted streets make me love both good ( 28 Days Later, The Last Man on Earth ) and barely passable (Vanilla Sky, I Am Legend) movies. Right now I feel like I’m living the dream and it’s not the best timing! I’ve arrived in Calgary to perform ‘Sounds From Above the Ground’.. a work that asks how we deal with urban sound environment, how we place ourselves when the sounds we make are drowned out by the city noise… unfortunately I’ve arrived on a Sunday followed by Thanksgiving Monday, so there is a real absence of noise and it’s making it hard to rehearse the work. On a personal level I love it though, the lack of heavy traffic and busy restaurants make it possible to hear further than usual, and my ears are constantly alerted to things that I probably would have missed. I hear cans being thrown out from a half open garage door as someone searches through bins… Shopping carts trundle past on every street, weighed down with all those things that we threw away or abandoned… It’s like watching a melancholy recycling service. I imagine tomorrow the streets will refill, and so today I’m heading out again to grab those last moments of hearing the often missed details.